Since I grew up around the corner, visiting the Gateway of India makes my Mumbai visit complete, like visiting relatives, or a nearby temple or eatery. Gateway of India is home. On a recent early morning visit, I noticed this group of out-or-towners striding to the waterfront. 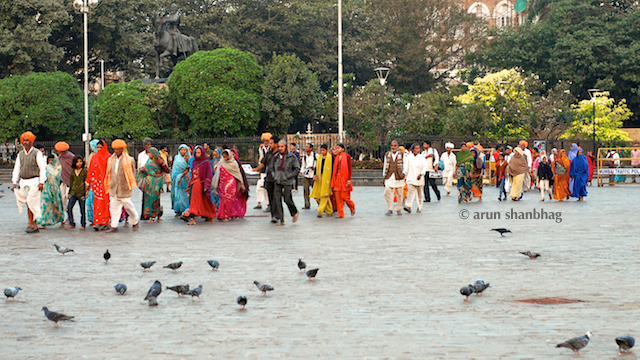 Women in colorful sarees and ochre turbans of some of the menfolks caught my eye. They did not oooh and aaah at the sights, but peered at the boats, at the horizon, mumbled to each other and marched back to their waiting bus. 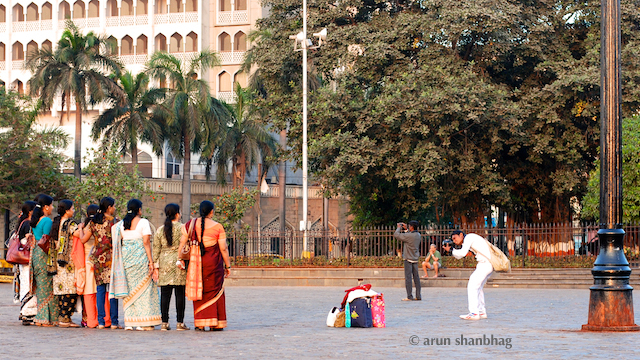 Obviously unimpressed, they spent less than five minutes at this major tourist attraction in Mumbai. This gentleman (featured at the top) remained stoic as I took his pics. 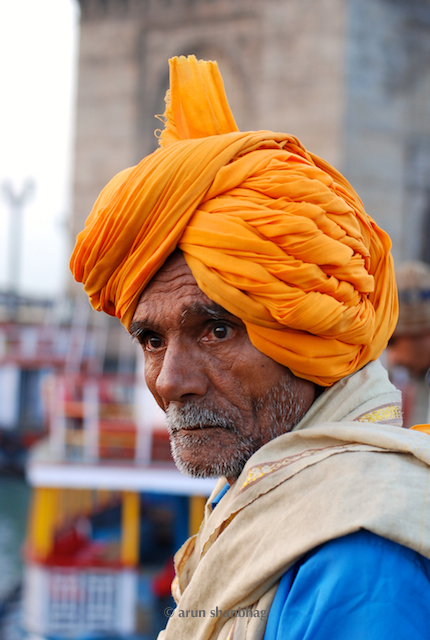 When asked where he was from, he muttered, “Madhya Pradesh,” and continued to gaze at the boats. Boats docked at the Gateway. 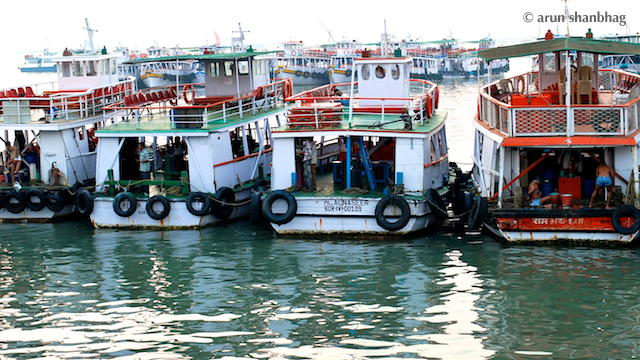 More pics of boats at the GOI in my earlier post. 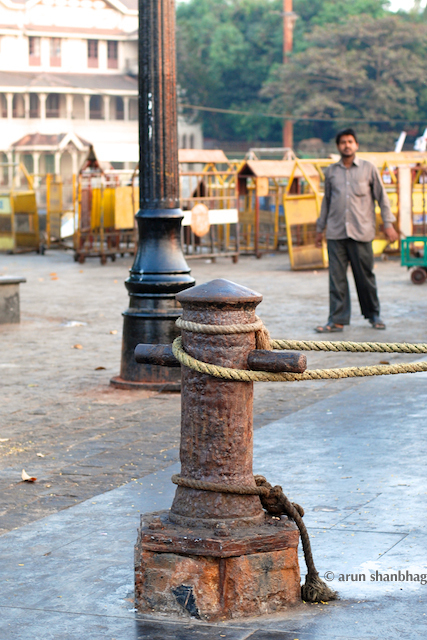 An ancient bollard still in service. Other visitors obviously love posing for pics at the GOI. 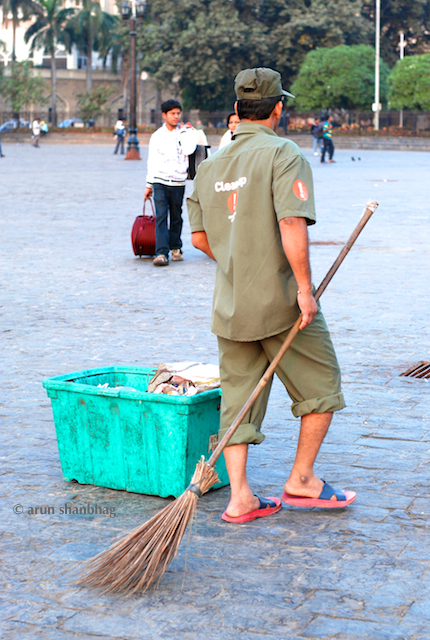 A sweeper at the Gateway of India. We all have our loads to pull. 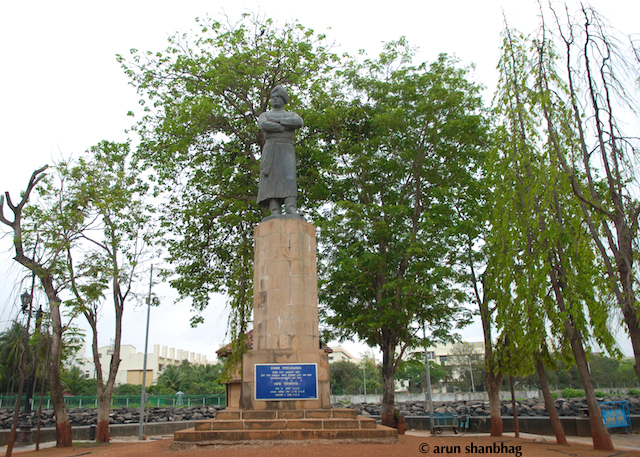 Often missed, this beautiful statue of Swami Vivekananda at the Gateway of India (from an earlier visit). I’d like to feature this post on DNA’s Around the Blog page. Also send a link of your blog with the mail. Thank you for considering this blog. First visit to your blog….Was impressed by your regular writing and fantastic photography. Hope this will encourage me to stick to blogging and spend more time. Thank you for your kind words ~ by that, I too am encouraged to do more and better. I wonder if it was the first they were seeing the ocean? I did notice in Bangalore too bus loads of tourists from MP! Some promotion must be going on! Must be some promo ~ They literally came off the bus and everyone marched back on in 5 minutes. They were done. Obviously, they cared two hoots about the GOI, but wanted to see the water. love the very first image…the potrait is just so striking…so much calm and composure on his face. Thanks. You got it. I wanted to post that portrait; the rest of the post was only for context. Yaa, he appears so unperturbed by anything going on (and I was taking a pic from about 6 ft away). 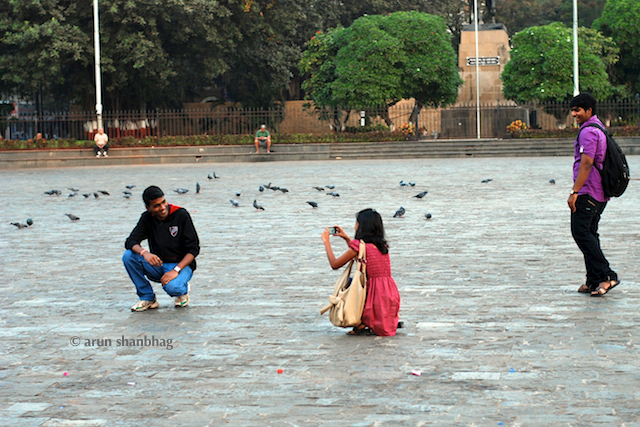 You’ve nicely captured the Gateway of India with much serenity. Looks so pleasant. All the times I’ve visited, it was utterly chaotic and bustling. I almost felt like I was getting lost in an amusement park! It is still super chaotic in the evening. Early mornings is the best time to quietly enjoy the GOI. 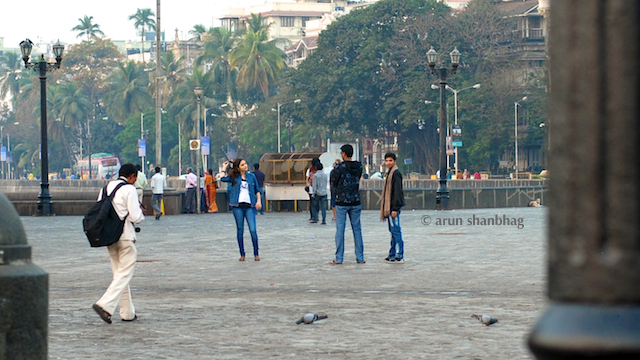 As a child, I remember visiting the Gateway of India every vacation and also with every visiting relative who wanted to drink in the sights of mumbai. Off late though, there hasnt been so much time. About a year back, I took my daughter to visit the Gateway of India and also took her for a boat ride because she loves that. As soon as we reached there, I knew the GOI was not a tourist attraction anymore. The Taj was what interested most tourists who kept pointing to the it and talking about the terrrorist attacks that happened there a few years back. I guess the morbid attraction of the Taj is more powerful than history. You are right, I call it “Terror Tourism.” The Taj and folks like to have an expensive beer at the Leopold Cafe. The owner there has also not changed the glass with a bullet hole and a depression in the floor from the grenade. These are great tourist attractions. Yes, I used to take Meera there many mornings to see the pigeons, but now everything is hemmed-in in twisted, rusting metal barricades.